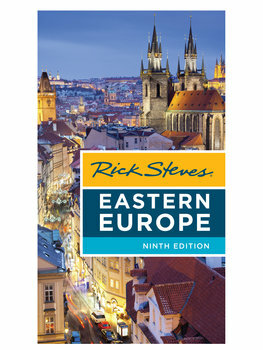 Should I get Rick's Prague guidebook (or Prague Pocket guide) in addition to this Eastern Europe book? If you're spending only a few days in Prague, Rick Steves Eastern Europe is all you're likely to need. Should I get Rick's Budapest guidebook in addition to this Eastern Europe book? If you're spending only a few days in Budapest, Rick Steves Eastern Europe is all you're likely to need. If, however, you're spending four days or more in Budapest, or at least a week in Hungary as a whole, the extra information in Rick Steves Budapest can be worthwhile. It offers more in-depth sightseeing information on Budapest, several additional self-guided city walks and museum/sight tours, and more specifics on shopping and entertainment, plus activities for kids. It also includes all of Rick's favorite Hungarian destinations outside the capital, plus nearby Bratislava. Should I get Rick's Croatia & Slovenia guidebook in addition to this Eastern Europe book? Rick Steves Eastern Europe includes full coverage of the main destinations in Slovenia: Ljubljana, Lake Bled, and the Julian Alps. (Additional Slovenian destinations are covered in Rick Steves Croatia & Slovenia.) However, Rick Steves Eastern Europe includes only short overviews of the highlights in Croatia, as well as Bosnia-Herzegovina and Montenegro — all of which are covered in depth in Rick Steves Croatia & Slovenia. So, if your Eastern Europe itinerary includes only the main stops in Slovenia, this book is all you need. But if you're doing more in-depth travel in Slovenia, or spending substantial time in Croatia, you'll want to add Rick Steves Croatia & Slovenia to your suitcase. Should I get Rick's Snapshot guide for Dubrovnik in addition to this Eastern Europe guidebook? Rick Steves Eastern Europe includes only a brief overview of Dubrovnik. If you'll be visiting that city, you should definitely pack along Rick Steves Snapshot: Dubrovnik. Or, if your Croatian travels will extend beyond Dubrovnik and its immediate day trips, pick up the full Rick Steves Croatia & Slovenia. Should I get the either of Rick's Vienna books in addition to this Eastern Europe guidebook? Should I get the Snapshot guide for Kraków/Warsaw/Gdańsk in addition to this Eastern Europe guidebook? No, because Rick Steves Snapshot: Kraków, Warsaw & Gdańsk is simply the excerpted Poland chapters taken directly from the complete Rick Steves Eastern Europe guidebook.